On June 28, 2014, the launch event of the new HYST machine took place in Mendrisio (Canton of Ticino, Switzerland) The new HYST machine has been entirely financed by the association Scienza per Amore and produced by the Company BioHyst. The official launch represents the concrete start of the international cooperation project Bits of Future: Food for All. 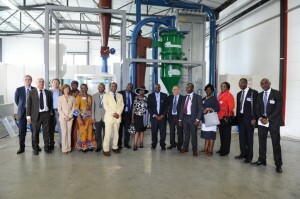 In fact the unit will be used to process biomass from the African countries. Diplomatic representatives from ten African countries attended the event (Benin, Burkina Faso, Burundi, Ivory Cost, Ghana, Liberia, Nigeria, Somalia, Tanzania e Uganda). Moreover entrepreneurs, media representatives and all the Scienza per Amore members (financial sustainers of the technology) were present. Engineer Vito Pignatelli (ENEA, Coordinator Biomass and Bioenergy Technologies, Technical Unit for Renewable Energy Sources), who has been following the development of the technology, participated in the event as well. In the morning, Scienza per Amore representatives briefly explained the story of the project and all the problems encountered. This event also gave the art initiative A Bridge Connecting Continents the opportunity to be presented. The initiative, promoted by the association Versoltre, aims at sustaining Bits of Future: Food for All. Danilo Speranza, founder of the project Bits of Future: Food for All, closed the first part of the event with his speech. He expressed his determination to keep pursuing his objectives, despite all the personal attacks he received. After Speranza’s speech the Somali Ambassador, Mr. Awes Awes, said that his Country has known the project for more than fifteen years and concluded by saying: -Who doesn’t want the technology to reach Africa? We do, and we are here to demonstrate it-. Ghana Ambassador and permanent member of the WFP, Her Excellency Evelyn Anita Stokes-Hayford, reminded the audience of her solidarity to the association Scienza per Amore throughout the difficult years. Then she declared: -we are going through a dark tunnel, but we can see the light at the end (…). We are talking about feeding the world, not only Africa.- Other African representatives agreed with the Ambassador of Ghana and expressed their praise while renewing their interest in the project Bits of Future: Food for All. In the afternoon, the guests were taken to the showroom containing the latest generation HYST machine where its characteristics were explained to the attendees. Then the machine was turned on in order to explain the process step by step and all the guests’ technical questions were answered. At the end of the day, all the ambassadors agreed to schedule an official meeting with the Italian Institutions to request their collaboration to start the Project, as soon as possible.